Ravindra Jadeja, who was one of the heroes of India’s illustrious win at Lord’s after 28 years has been fined with 50% of his match fee for his involvement in “pushgate” incident with James Anderson during the second day’s play of the first test between India and England. “India’s Ravindra Jadeja has been found guilty of a Level 1 breach of the ICC Code of Code for Players and Player Support Personnel for his involvement in an incident with James Anderson during the second day of the first cricket Test against England at Trent Bridge on 10 July,” ICC stated through a media statement on Friday regarding the pushgate incident. BCCI though has decided to appeal against the judgement and has strictly registered their disapproval over the decision of ICC referee David Boon. “The BCCI wishes to make it clear that it is not satisfied with the verdict. The BCCI reserves its right to appeal against the sentence. The BCCI believes that Mr Ravindra Jadeja was not at fault, and supports him fully,” the BCCI said in a statement. 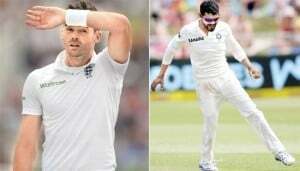 Ravindra Jadeja and James Anderson were involved in a physical spat at the end of second day’s play at Tent Bridge. Indian Team had lodged a complaint to ICC regarding the same, hearing of which is still pending. England cricket team responded with filing a case against Ravindra Jadeja, ICC didn’t found him guilty of which. Instead Ravindra Jadeja was found guilty under Article 2.1.8 by ICC referee David Boon which refers to ‘conduct contrary to the spirit of the game’. Anderson and Jadeja were found shaking hands with each other post the Indian victory at Lord’s, keeping aside the sore relations post the pushgate incident, hailing the spirit of the game. Under Article 6.1 of the Code, I had to be comfortably satisfied that the offence had occurred in order to find Mr Jadeja guilty of an offence under Article 2.2.11. While I was in no doubt that confrontation did occur, and that such conduct was not in the spirit of the game and should not have taken place, I was not comfortably satisfied that this was a level 2 offence. Therefore, in exercising my discretion under Article 7.6.5 of the Code and having heard all the evidence, I was comfortably satisfied that Mr Jadeja had committed a level 1 offence under Article 2.1.8 of the Code.” said Mr. Boon. Meanwhile, James Anderson’s fate is due to come out after the Southampton Test. Pushgate incident has raised the expectations from the ongoing India vs England test series. Previous articleDoes Lord’s 2014 remind of Eden Gardens 2001?